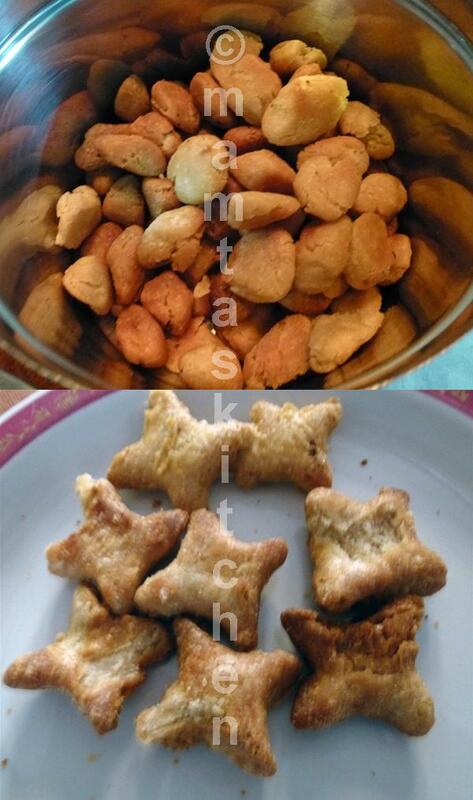 Note from Mamta: Tun-tunae Mun-munae are a cross between biscuits and sweet ‘puas’ or ‘pakoras’. In my parents’ house, they were made only once a year, on the Hoi day. After the pooja (prayers), our mum will have us all sitting around her and then ‘throw’ them in front of us. We would then grab as many as we could. It was a kind of game, to see who got the most! I have never seen any recipe for it on the internet anywhere and I wonder if anyone else has this tradition in their family! If they are, get in touch, with your family tradition, recipe differences and pictures. Dissolve sugar in warms water. Place flour and ghee in a bowl and mix until you get a crumbly mix. Make dough by adding sugared water slowly and mixing it in, until you get a firm…ish dough. Knead again to get smooth dough. Heat the oil to medium hot. Tuntune fried in very hot oil will be too soft and uncooked inside. Break off small bits of sou8gh and shape them into small barrels or stars. Deep fry in small batches until nicely browned.